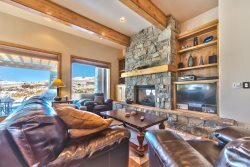 Two bedroom waterfront condo with a private hot tub that is less than ten minutes to Snowbasin. This waterfront property in Lakeside Village is ideal for two couples or a young family as it offers the closest location to Snowbasin Resort, which is just a 10 minute drive from the door. Powder Mountain is a short 20-minute drive and Wolf Creek Ski area is 15 minutes away. Park City is just an hour`s drive, while all the urban conveniences are available in Ogden, which is just 10 miles form the door. Salt Lake`s airport and cultural opportunities are just 50 minutes away. This new 2 bedroom lakefront condominium offers an expanded deck with generous private hot tub and rustic interior finishes including slate & granite with hardwood floors throughout. Mountain-style furnishings offer casual elegance and the views across the lake to Powder Mountain are breathtaking. It`s the perfect place to star gaze and relax after a long day of recreation. On-site amenities include a gym, swimming pool, community hot tub, tennis courts and access to the lake via a walking trail to the shoreline.